This installment of Shifty Lines takes us to another region of Asia. After looking at ethnolinguistic divides in north Asia, the Persosphere, and the Caucasus, we move now to the region known variously as the Indian subcontinent, “India,” and (most correctly) South Asia. South Asia has been the seat of empires throughout its history, starting from before the Indo-Aryan invasion with the Indus Valley Civilization. Almost universally based in the north, these empires differed in how far into the subcontinent they conquered. The early Mahajanapadas only edged into southern India, while the Maurya and Gupta Empires controlled virtually all of South Asia, including the Maldive Islands. The rest of the time, southern, Dravidian India was independent under the Chola, Chera, and Pandya dynasties, with the Cholas managing to conquer much of India and parts of Indonesia and Southeast Asia in the 10th century CE as well. Sri Lanka was part of some of these South Indian empires, establishing a Dravidian minority alongside its Indo-Aryan majority. During these periods of empire, the characteristic native religions of South Asia, Hinduism and Buddhism, became established, with Buddhism spreading into East and Southeast Asia as well. Empires based in South Asia rarely crossed the Himalaya and Arakan mountains that separate modern India from Burma and China, while their borders with the Persian Empire were much more fluid. The Himalayan regions of Nepal and Bhutan likewise retained their independence throughout most or perhaps even all of these imperial periods. Thus, while the empires of India were the equals of any of their better-known neighbors and trading partners, they did not succeed in conquering a region vastly outside the currently recognized boundaries of South Asia. These geographical limitations set up the next phase of India’s history: the Muslim conquests. Between the 7th and the 15thcenturies CE, South Asia faced repeated invasions from Muslim powers, including the Umayyad Caliphate that conquered Spain. The combination of invading armies from Persia and Central Asia and Arab mariners establishing trading posts along India’s western coast introduced Islam to India, which would eventually become home to one of the world’s largest concentrations of Muslims. Numerous kingdoms became sultanates ruled by Persian and Central Asian conquerors, most notably in Delhi, while the south responded by uniting into the Hindu Vijayanagara Empire to repel further attackers. Muslim dominion in South Asia culminated with the Mughal Empire, during which Central Asian conquerors gained control over almost all of South Asia extending into Afghanistan and even further northwest, while never penetrating the southern tip of the Deccan. Like many ancient empires, the Mughals exerted their power through vassals and tributary states, rather than having direct control over their vast holdings. This decentralization, combined with Mughal appreciation for South Asian culture, led to the development of numerous syncretic and idiosyncratic forms of Islam in South Asia, many of which persist as the majority religions of various South Asian groups to this day. Still, Islam was still widely viewed as a foreign intruder in Hindu-majority India, especially when subsequent Mughal rulers began rigidly enforcing Islamic norms and legally penalizing non-Muslims. The Mughal period collapsed into a series of smaller empires much like the ones that had preceded them. Former vassal states became ascendant, conquering virtually the entire region over the ensuing century. In particular, the Maratha Empire emerged from central India to usurp Mughal control over most of South Asia, and the Sikh Empire became a formidable military force that conquered Punjab, Kashmir, Himachal, and nearby regions. The Marathas were the last Hindu empire to rule in India, and their navy kept Arab, Portuguese, and other invaders at bay until the British conquest. India might have emerged into modernity as the Maratha Empire, analogous to the late-stage empires of Europe like the Byzantines or the German Confederation or, indeed, Safavid Persia. Instead, it received colonization efforts from Portugal, the Netherlands, France, and Britain. Initially, all four were restricted to coastal enclaves, repelled by the powerful Marathas. Britain proved the most insistent of the colonial interlopers, and via the East India Company spent the years between 1617 and 1857 turning Maratha vassals and tributaries against each other and steadily gaining control over South Asia in the process. In 1857, the region was reorganized into the British Raj, a patchwork entity with some regions under direct British administration, other “Princely States” and protectorates left in local hands pledged to Britain, and a handful of other European enclaves outside Britain’s control. While the heavy British hand did lead to investment in railways and other engines of future Indian prosperity and to the end of the widespread practice of sati, it also prevented South Asia’s nations from coalescing on their own terms. Instead of separating into ethnolinguistic groups like the successors of Rome, the nations of South Asia were, first and foremost, held together within the British Raj, and secondarily within its various provinces and princely states. Within the British Raj, particularly in the regions outside the princely states, internal borders frequently shifted in order to reward groups perceived to be less rebellious or more loyal to British rule, such as Muslims and South Indians, or to pacify incipient violence. These moves often met with hostility from the locals, particularly the attempted partition of Bengal province in 1905. The British offered increasingly bizarre scenarios for Indian representation in their own affairs, allocating seats in the new Indian Parliament for Muslims, Untouchables, and other sometimes overlapping social groups, in many cases creating spaces for agitators that didn’t exist before. The rest of the 20th century was a whirlwind of revolutionary sentiments. Dissatisfaction with and opposition to British rule grew steadily, forming a backdrop for struggles over what sort of entity South Asia would become. Some voices, including famous names like Mohandas Gandhi, called for unity between South Asia’s feuding groups, and especially an end to the escalating violence between Hindus and Muslims. At the same time, other agitators built an ideology of Hindu and (especially) Muslim nationhood, maintaining that the two religious communities were distinct enough that coexisting within a single secular state was neither possible nor desirable. The British, for their part, secured Indian participation in World War II by promising local leaders that India would be divided into independent Commonwealth dominions at the war’s close. Other parts of the British South Asian sphere—Hindu Nepal, Buddhist Bhutan, Buddhist Burma, Buddhist/Hindu Sri Lanka, and the Muslim Maldives—had been separated earlier or were never formally inside the Raj, and had separate arrangements with the British Empire. The 1947 Partition of India split the British Raj into two states: a Muslim-majority Pakistan consisting of modern Pakistan and Bangladesh; and a Hindu-majority India. This not only involved separating existing nations from each other, but drawing lines through Kashmir, Punjab, and Bengal and separating each into Muslim and Hindu sections. These lines were messy and inconsistent, and in any event could not separate Muslims and Hindus completely from each other in such heterogeneous regions. Though conceived for the ostensibly noble purpose of combating South Asian religious violence, the Partition of India was a humanitarian disaster. The space between its announcement and its implementation consisted of alternating rounds of attempted genocide in Calcutta, with Muslim and Hindu Bengalis each trying to eliminate the other from the region or avenging the previous slaughter. Violence spread throughout northern India, including elsewhere in Bengal, Bihar, and the United Provinces (now Uttar Pradesh). The climate of hostility continued as the partition commenced. 14.5 million people fled from one side of the partition line to the other to escape persecution. In Punjab and Bengal, where the lines between Muslim and Hindu communities were particularly faint, thousands of people were maimed or killed while trying to cross the line or for refusing to leave an area where they were part of a minority. Neither new dominion was prepared for such an enormous migration, and hundreds of thousands more people died in transit due to poor travel conditions or in the poorly-provisioned refugee camps where they eventually settled. In India, Delhi received so many Hindu and Sikh refugees that its population doubled during the flood. In Pakistan, the arriving Urdu-speaking Indian Muslims coalesced into a new ethnic category, the Muhajirs, who became important members of Pakistan’s educated and governing classes. Instead of quieting inter-religious tensions, the partition has turned them into international tensions. India and Pakistan have fought several wars since they separated from Britain and from each other, and the border between them has been the site of continuous, deadly skirmishes between commandos from each country trained specifically for that purpose. Both countries are nuclear powers, their arsenals earmarked for each other. Post-independence India established itself as a secular state, unlike its new neighbors, and set about increasing the legal rights of women, members of lower castes, and others who faced religiously-motivated discrimination in earlier iterations of India. Implementing these and other aspects of the Nehru agenda faced the immediate hurdle of India having a flatly nonsensical series of subnational divisions. 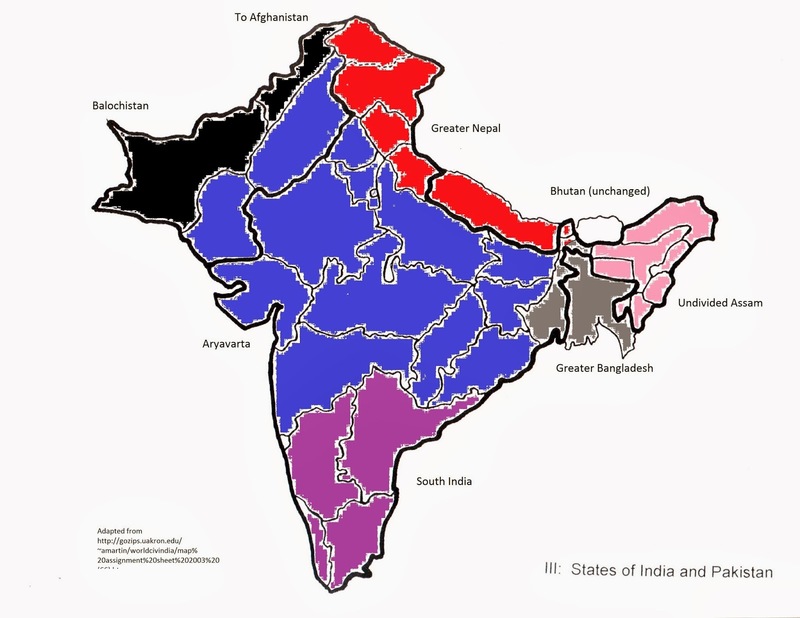 Even and perhaps especially with the removal of East Bengal, West Punjab, West Kashmir, Sindh, Balochistan, and the Afghan regions from India’s sphere, India’s boundaries encompassed a bewildering array of quasi-independent princely states and British-established provinces, with no internal logic other than historical accidents and colonizing convenience. The States Reorganization Commission set about to resolve this morass. Weighing several proposed schemes for rearranging India’s internal borders, the Commission eventually settled on a language-based system, over objections that such a system would hamper Indian unity by offering other, older identities a legal grounding. 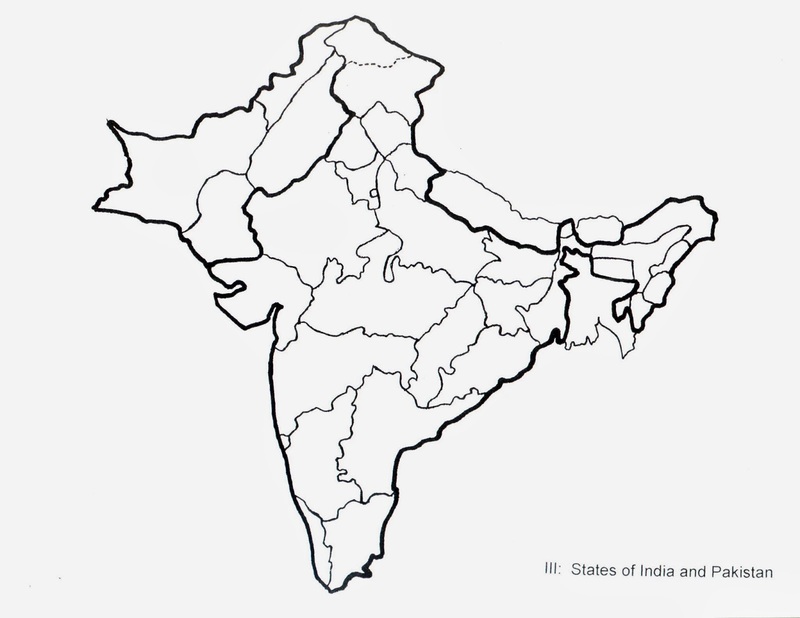 The States Reorganization Act of 1956 redrew the entire map of India, eliminating the princely states and colonial provinces altogether. Almost all of the new nation’s territory was redrawn into subnational units called “states,” each built around a large linguistic community and often combining territory from multiple old kingdoms and provinces to do so. This process was, to put it mildly, controversial, since many regions did not have a clear linguistic majority and were inevitably dissatisfied with their new placement. Other regions, such as the new Telugu-speaking state of Andhra Pradesh, raised concerns that other divisions within their cultures were elided in this system, a problem that remains under discussion. Subsequent revisions to India’s map added former French and Portuguese colonies as “Union Territories” after invading and occupying them; turned many of the remaining Union Territories into full-fledged states; and divided the states of Madya Pradesh, Bihar, Uttar Pradesh, and Punjab into smaller units. Pakistan underwent a similar but less profound process. Pakistan’s status as a country made of two regions separated by a massive cultural gulf and 1000 miles of Indian territory never functioned as intended, and the Bengali people became increasingly ideologically divorced from their distant fellows. The refusal of the Pakistani government to allow “East Pakistan” to use Bengali instead of Urdu (which had no history in the region) helped propel East Pakistan into decades of brutal civil war, with Indian intervention on the Bengalis’ behalf. In 1971, East Pakistan became the independent state of Bangladesh. The Bengali movement emboldened other separatist movements in Pakistan, in particular the movement for a free Balochistan, none of which have succeeded. Relatedly, the Pakistani government divided the former Northwestern Frontier Province into Khyber Pakhtunkwa and the Federally Administered Tribal Areas, separating the better-developed portions of the former Afghan region from their more rural, tribal kin. The Pakistani government, now officially an Islamic state, pushed religion as a unifying force in the fractious half-Iranian, half-Indo-Aryan country, a move that continues to hamper the region’s development into modernity. The same year, violence began between the Tamil and Sinhalese commmunities in Sri Lanka over a similar grievance—the newly independent country’s refusal to grant official status to the Tamil language and otherwise deal fairly with its largest minority. South Asia is an enormous and densely heterogeneous region, and it makes no more sense for it to be united into a handful of countries with fundamentally colonial borders with one another than it would for Europe to be five countries instead of 50. The comparison to Europe is particularly apt. Europe and South Asia are both the lands of empires succeeding empires for centuries, similarity imposed on difference. The difference between the two is that, in Europe, the concept of the modern nation-state took root and led to the establishment of homelands for dozens of ethnic groups from the rubble of fallen empires, contributing to the region’s dynamism to this day. 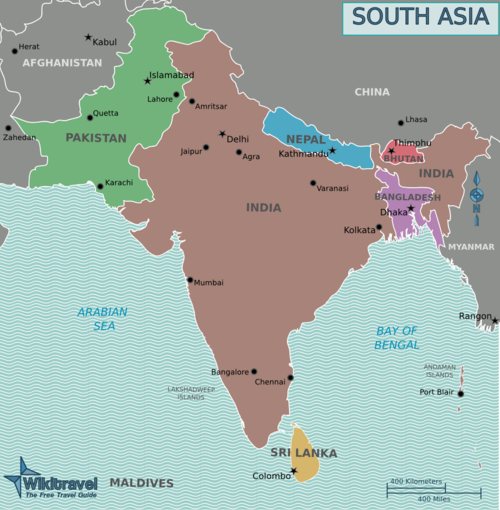 South Asia, by contrast, remains defined by the borders imposed on it by colonial powers. However, the structure of India’s and Pakistan’s internal borders provides hope that resolving these difficulties and establishing a fair and enduring peace over the region is easier than it might be in, say, central Africa. A number of regions are foci of instability and violence in South Asia, here addressed more specifically in a vague geographic order. The Pakistani regions of Balochistan, Khyber Pakhtunkwa, and the Federally Administered Tribal Areas (FATAs) speak languages from the Iranian, rather than Indo-Aryan, families. While both regions have a long history within the greater Indian cultural sphere, they pertain more properly to greater Persia. Indeed, the porous Pakistani-Afghan border means that, in terms of national unity, Pakistan has virtually no presence in the FATAs and Khyber Pakhtunkwa, and the Baloch separatist movement hopes to create a Balochistan out of the Balochi-speaking regions of both Pakistan and Iran. Both of these conflicts are addressed in Shifty Lines: The Persosphere, and Afghanistan will be revisited in a future installment. The Himalayas Mountains are perhaps the single most imposing continental divide in the world, a range of sharp-edged peaks that grows taller every year and kept China out of India and vice versa for the whole of world history. The mountain range itself is a distinct cultural region, with its own linguistic patterns that fade as one ventures into the lowlands immediately south. In particular, languages in the Pahari subset of Indo-Aryan dominate the entire region, including Kashmiri, Pahari, and Nepali, and the entire region boasts a mix of Indo-Aryan and Sino-Tibetan languages and minorities. The independent state of Nepal occupies much of the Himalayas range itself, and holds the honor of being one of only two states to avoid any recorded occupations or colonizations in its entire history, the other being nearby Bhutan. Nevertheless, the Anglo-Nepalese War of 1815 led to Nepal being forced to cede nearly half of its territory to the British East India Company, including what would become the Indian states of Himachal Pradesh, Uttarakhand, and Sikkim and the Gorkhaland region of West Bengal state in the 20thcentury. Britain’s victory was tenuous enough that, even despite these concessions and the right to recruit soldiers from Nepal (which it retains to this day), Nepal did not become part of the British Raj. Sikkim attempted to reassert itself as an independent entity on Indian independence, but was absorbed into India during a conflict between pro-independence and pro-India factions. Gorkhaland, relatedly, has been home to violent and non-violent agitators for separate administration from the rest of West Bengal since the 1980s, continuing to the present. Nearby Kashmir was not so lucky as any of these, and spent its history as a series of pricely realms passed between Afghan, Mughal, Sikh, and other empires. It was incorporated into the British Raj as the princely realm of Jammu and Kashmir, the largest in the Raj. During the Partition of India, the heterogeneous but overall Muslim-majority region seemed likely to accede to Pakistan, despite its eastward cultural links. Kashmir’s Hindu ruler wavered in his decision, leading Muslim militants from the rest of Pakistan to invade and try to force his hand. His call for aid from the Governor-General of the Raj, Lord Mountbatten, led to Kashmir’s future becoming a political football, demanded and offered in exchange for other concessions over and over. Three of the four India-Pakistan wars (1947, 1965, and 1999) were fought over Kashmir, as well as a mostly pointless war between India and China in 1961 over the uninhabited, forbidding Aksai Chin. The religious dimension of the dispute, with its roots in the Partition, has also led to the widespread suspicion that Muslim and Hindu religious extremists are operating in Kashmir, trying to tip the balance in favor of one country or the other. For now, the region is divided into four territories, two in India, two in Pakistan, with no resolution in sight. Human rights abuses, by militant groups and the Indian and Pakistani governments, run rampant, with ethnic cleansing efforts against the Hindu populations in Muslim-majority regions of Kashmir being particularly frequently reported. The idea of asking the people of Gilgit-Baltistan, Azad Jammu, Ladakh, and Jammu and Kashmir what sort of future they want seems to be something that none of the sides involved are willing to consider, despite demands to that effect from the UN. Another of the three regions most harshly impacted by the Partition of India, Punjab is also one of the more complicated. Sikhism originated in Punjab in the 15th century, and until recently the chevron-shaped region included large Muslim-, Sikh-, and Hindu-majority areas. These diverse communities are united by geographic proximity, common cultural elements, and the Punjabi language. Punjab had previously been part of all of the large empires of northern South Asia, most notably the Sikh Empire whose defeat placed the region in British hands. 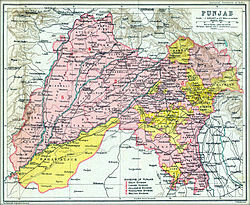 At the time of British conquest, the region’s internal districts masked the larger religious division, in particular mostly erasing the region’s very large Sikh constituency. As the Partition of India was discussed, Sikh representatives asserted their worry that a split focused on Hindus and Muslims would ignore their interests. This evolved into a demand for a third independent state in what is now Indian Punjab, to be run as a Sikh theocracy and known as Khalistan. This demand went explicitly unheeded, as the powers behind the partition insisted on making India and Pakistan as large as possible. The Partition of India drew a line roughly between the Muslim-majority parts of Punjab in the west and the rest of Punjab in the east. The new line and the explosion of violence surrounding it encouraged the concentration of Punjabi Sikhs in Indian Punjab. Shortly thereafter, a new movement called Punjabi Suba called for the creation of a Punjabi-majority state in India, essentially requesting that the Haryanvi/Hindi- and Pahari-speaking parts of the existing Indian Punjab be partitioned out. Initially, the Indian authorities under Indira Gandhi strenuously resisted this demand, recognizing that this Punjabi-majority state would, effectively, be a Sikh-majority state within India and fearing the implications of that development. The fact that the Punjabi Suba movement was led by many of the same people as the Khalistan movement was, likewise, not secret. This hostility was amply demonstrated during a peaceful demonstration in 1955, during which Indian police responded with violent beatings, tear gas grenades, the hostile takeover of the Harmandir Sahib temple (also known as the Golden Temple of Amritsar), and 12,000 arrests. Still, the Indian government acquiesced in 1966, assigning parts of northern Punjab to Himachal Pradesh and other parts to the new state of Haryana and territory of Chandigarh. The new, truncated Punjab was emphatically Sikh-majority and Punjabi-speaking, to contrast with the Muslim-majority Punjab Province of adjoining Pakistan. Proponents of an independent, theocratic Khalistan continued to agitate, gathering support and funds from the Sikh diaspora in the United States and elsewhere. Within a few years, the movement turned violent, leading to skirmishes throughout Punjab and particularly in and out of Sikh temples that doubled as bases of operation. Many proponents, including Jagjit Singh Tauhan of the Khalistan National Council in the UK, demanded a Khalistan that includedthe Hindu-majority areas removed from Punjab in 1966. Tauhan went further and appointed a cabinet and began issuing Khalistani currency, without so much as being inside the territory he claimed. The Indian government responded with an escalating series of counter-insurgency operations, the largest of which was termed Operation Blue Star. Operation Blue Star damaged the Akal Takht, a particularly important Sikh holy site, leading to widespread condemnation in India and to the assassination of Indira Gandhi by her Sikh bodyguards. Riots and slaughters continued to alternate and escalate until the 1990s, when the Indian government finally apprehended the violent elements of the Khalistan movement. The largest and most important Khalistan-promoting organization, the Akali Dal, ended hostilities with the signing of the 1985 Punjab Accord, but several non-violent groups continue to push for a Sikh state within or even outside of India, alleging that the terms of the Accord have not been satisfied. In any event, no secular Punjabi-nationalist movement has come close to the power and relevance that the Khalistan movement held, and the still-recent scars of the Khalistan movement’s efforts are likely to keep would-be Punjabi nationalists quiet for decades to come. The region of Bihar and Jharkhand is, in a sense, a microcosm of North India as a whole. Bihar (which until 2000 included modern Jharkhand) was the seat of the Maurya Empire, and this legacy provides the modern state of India with some of its most visible symbols, including the Ashoka Chakra on the Indian flag and the Ashoka Lion Capital that serves as India’s emblem. Bihar is directly adjacent to the Hindi heartland of Uttar Pradesh, yet contains a multiplicity of Indo-Aryan and other languages, most visibly Bhojpuri and Maithili. 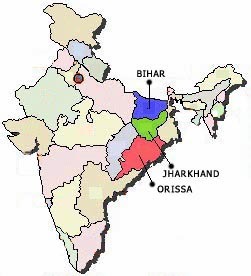 The creation of Bihar as a state in modern India was, to a degree, an afterthought of the better-conceived genesis of Bengali- and Oriya-speaking regions out of the former Bengal Presidency, and this is reflected in the linguistic and economic divisions that continue to mark the region today even after the separation of Jharkhand. Bihar and Jharkhand are among the least-developed and most densely populated regions in India, comparable only to the isolated, neglected Seven Sisters states in the Northeast. While both modern states are extremely resource-rich, those resources have either remained untapped or effectively subsidized other, more coastal parts of India. In the colonial period, the riches of Bihar went to individual wealthy landowners, to Calcutta and other Bengali destinations and from there to Britain. British East India Company policies encouraged this specific dynamic, sparking bloody tribal revolts between 1895 and 1900 and laying the groundwork for persistent grievances and for the Naxalite Maoist/Communist insurgencies that still call Bihar and Jharkhand home. The pattern continued into independent India. India’s freight equalization policy subsidized the cost of moving raw materials around India, officially to encourage development throughout the country. Instead, it diverted development away from remote but resource-rich places like Jharkhand and toward already-prosperous, coastal regions like Gujarat and Maharashtra, where other costs of business were lower and export was easier. While the policy was discontinued in 1993, it is likely that Bihar and Jharkhand will take decades longer to recover from this de facto internal colonization. This history of poverty and disenfranchisement has made Bihar and Jharkhand also India’s preeminent source of internal migrants. Bihari people commonly seek opportunities elsewhere in India and become the focus of suspicion, bigotry, and even violence as a result, being viewed much as the worst elements of American culture view Hispanic immigrants from Mexico and Central America. Bangladesh treats Bihari people no better, and a population of Muslim Bihari immigrants known as the “stranded Pakistanis” has been stateless in Bangladesh for 33 years as an unfortunate result of Bangladesh’s independence from Pakistan. Bihari people also suffer a disproportionate share of the invective that North Indians receive in South India for the same reason. The fallout from all of the above is that the people of Bihar and Jharkhand are perhaps the subset of India that has benefited least from both the Partition and from the States Reorganization Act. The separation of Jharkhand, which has the bulk of old Bihar’s mining resources, from the more agricultural and service-oriented Bihar proper may help alter this dynamic, at least within greater Bihar. More impressively, this separation gives the “tribal people” of Jharkhand—now nearly 30% of the population of their home state—a far greater say in their affairs. Newer movements hope to establish a separate Maithili-speaking state from the northeastern half of Bihar and some of Jharkhand, and to build a Bhojpuri-speaking state out of the rest of Bihar and parts of neighboring Uttar Pradesh. For now, it seems unlikely that any community in Bihar or Jharkhand will advocate for a separate, independent nation-state, but such agitations may arise if the Naxalites rise to power in the region or if the Bihari and Jharkhandi economies continue to lag behind those of the rest of India. Long one of India’s preeminent cultural centers and the seat of the Pala and other empires, the Bengali-speaking region comprises the Ganges-Brahmaputra river delta up to the Himalayas. Its largest city, Kolkata (Calcutta to the British), served as the capital of the British Raj for centuries, and the region held an outsized importance both for its neighbors within India and for the British. During the British Raj, Bengal encompassed much of eastern India, encompassing large Hindu and Muslim populations and numerous linguistic groups. This combination created many difficulties in the Bengal Presidency, especially in light of overwhelming favoritism toward certain demographics. Most of the Bengal Presidency’s large landholders were Hindus living in the western half of the territory even when their holdings were in the east. Additionally, development focused on the west and the Presidency’s only university was in Calcutta, the western capital. The large Muslim Bengali constituency in the east agitated strongly for a greater role in the territory, and the rulers of the British Raj turned this to advantage by partitioning the territory in 1905. The presidency was divided in two, with the modern regions of Bihar, Jharkhand, Odisha, and West Bengal on the west, and Bangladesh, Assam, and the “Seven Sisters” states on the east. While the partition was meant to be along religious lines, East Bengal included many Hindu-majority areas. This partition, and the accordant development of a new East Bengali capital at Dhaka to counter Kolkata’s prominence, made the partition very popular with the region’s Muslims. Other forces, including pro-independence agitators, saw the partition as a way to weaken what could otherwise have been a united Bengal or resented the loss of control over landholdings on the other side. This partition lasted only six years, being replaced in 1911 by a new scheme that reunited Bengal and separated from it a new Bihar and Orissa (to eventually become Bihar, Jharkhand, Odisha, and parts of other states) and a new Assam (to become Assam and the Seven Sisters). Other legacies of the 1911 partition include the Swadeshi movement of economic protest against British rule, moving to retake indigenous control of India’s economy by supporting Indian businesses and eschewing British imports; and the movement of the British Raj’s capital from Calcutta to more central New Delhi. A united Bengal would not last much longer. As in western India, sectarian tensions continued to flare up in Bengal, and the province would again be partitioned in 1947. The eastern, Muslim-majority portion of Bengal separated from India as East Pakistan, nominally joined to the distant regions of Punjab, Sindh, Balochistan, Northwestern Frontier Province, Azad Jammu, and Gilgit-Baltistan. As noted earlier, this partition proved disastrous, and the nightmares that unfolded during the terrified flight of millions of Bengalis and others in both directions across the new border are the stuff of haunting poetry. Still, outright violence was limited compared to Punjab, and the Bengali migrations transpired over decades rather than years. Economically well-situated people, in particular high-caste Hindus, migrated first, often transferring their government posts directly from one to the other. Later in the migration, violence, state-sanctioned discrimination in East Pakistan, and less official marginalization in West Bengal compelled further migration in both directions. East Pakistan’s / Bangladesh’s geography worsened the consequences of partition. After Bangladesh separated from India, rail and other connections between India and Bangladesh were severed, and with them, connections between Northeast India and the rest of India. Assam and its orbiting states were now connected to the rest of India by a narrow, contentious stretch of West Bengal known as the Siliguri Corridor, rather than by long-standing paths to Kolkata. Likewise, the economy of the Bengal region was cut apart, with the fertile floodplains of the east now isolated from the commercial and manufacturing hubs in the west. The partition also left intact a liberal freckling of enclaves and counter-enclaves inherited from the earlier principalities, in which specks of Bangladeshi territory were wholly encompassed by India or vice versa. This situation reaches a fever pitch of absurdity in Dahala Khagrabari, an Indian enclave inside a Bangladeshi enclave within an Indian enclave within Bangladesh. In these areas, thousands of citizens of one country are effectively trapped without access to basic utilities and services, since they cannot visit government offices to obtain passports and other travel documents without leaving the country and the two refuse to run power lines and other amenities through each other’s territory. Even this situation would change one more time. While separation from India gave the Bengali Muslims the voice they desired, being attached to Pakistan threatened to squelch it all over again. East Pakistan’s population exceeded that of all other parts of Pakistan put together, but Bengali had no official status at the national level and East Pakistan remained but one province among seven. Pakistani culture, government, and economic investment focused heavily on the western half of the country, exacerbating the damage done by isolating East Bengal from West Bengal and marginalizing Kolkata’s educated class. West Pakistani elites regarded the Bengalis as unduly influenced by Hindu culture, as evinced by their preference for Bengali in the Devanagari script (most closely associated with the Hindi language) over Urdu in Perso-Arabic characters. Numerous schemes were devised to keep political power in the western half of Pakistan, culminating in the “two-unit scheme,” in which East and West Pakistan were designated the basic units of the country, apart from any lower-level divisions, in order to solidify a West Pakistani influence that demographics would otherwise have weakened. The Bengali Language Movement fought against this lack of adequate representation, pushing for Bengali to coexist with English and/or Urdu as an official language and to develop Bengali as a language for literature and education. This movement faced numerous police and even military reprisals for its advocacy, and one of Bangladesh’s national holidays is a memorial to those killed in its service. At the same time, an organization called the Awami League pushed for Bengali interests in the Bengali and Pakistani parliaments, winning a majority in the latter in 1956. Two years later, Pakistan experienced a bloodless coup d’état, followed shortly thereafter by the banning of all political parties and various other attempts to restructure the Pakistani government. These efforts set off the 1971 Bangladesh Liberation War and, thanks to the fallout of the resulting flood of new refugees into India, the third of the four wars between India and Pakistan. The war ended with an independent, nominally secular Bangladesh consisting of the Muslim-majority part of the larger Bengali-speaking region, the Hindu fraction of which remained as the Indian state of West Bengal. It also ended with the creation of the “stranded Pakistanis,” a population of Bihari Muslims in Bangladesh who sided with Pakistan during the war and were denied citizenship afterward, becoming stateless. Nestled in the junction between the Himalaya and Arakan Mountains, the region now known as Northeast India has a different history than the rest of South Asia. Once united as the Kamarupa Empire, the region spent most of its history under the control of Tai (not to be confused with Thai) and Burmese polities based in neighboring Burma. Unlike most of North India, Northeast India avoided dominion by the Mughals. Thanks to this unique history and geography, most of Northeast India’s notable ethnic groups speak Sino-Tibetan languages and have many genetic and cultural elements in common with the peoples of neighboring Southeast Asia and Bhutan. The Indo-Aryan Assamese, with a territory at the center of the region and bordering the homelands of the other groups, served as a core unifying force even when the region was under outside control. At the time of British arrival in 1824, Northeast India consisted of a number of small, warring kingdoms, which fell prey to the advancing Third Burmese Empire. Britain intervened on behalf of these kingdoms, adding them to its growing South Asian empire with its victory. The Burmese defeat was so decisive, and the demanded Burmese concessions so steep, that the Burmese themselves fell under British sway by 1885. Assam and its neighbors, except for the princely states of Manipur and Tripura, became part of the Bengal Presidency until 1873, when (as noted earlier) the Presidency was segmented into separate Bihari, Oriya, Bengali, and Assamese regions. “Undivided Assam” did not change borders with the States Reorganization Act, despite the Assamese themselves being a majority only in the center, riparian zone and the region’s numerous other groups being majorities elsewhere in the new state. The other peoples of Undivided Assam had to wait until 1963 (Nagaland), 1972 (Meghalaya), 1975 (Arunachal Pradesh), and 1987 (Mizoram) to have their homelands separated into distinct Indian states. Assam, Manipur, Tripura, Nagaland, Meghalaya, Arunachal Pradesh, and Mizoram became known as the “Seven Sisters,” a group of culturally distinct, interlinked states isolated from the rest of India by the positions of Bangladesh, Nepal, and Bhutan. Northeast India’s distance from the Indian heartland and general geographic remoteness led the region to be underdeveloped during the colonial period, a situation that is only now beginning to be remedied. The sentiment that India is not doing enough to curb or regulate illegal immigration from neighboring Bangladesh is also widespread. The Bengali population of Tripura has grown to 70% of the state’s total, and the Bengali population of Assam is so large that implementation of Assamese as an official state language has become a contentious issue. This systemic neglect, combined with the region’s cultural distinctiveness, memories of how long its peoples had to wait for states of their own despite India’s supposed commitment to linguistic homelands, and recognition of the Seven Sisters’ ample resources, has made Northeast India a hotbed of separatist sentiment. In Assam, numerous groups have fought or agitated for Assamese independence from India. The most prominent of these, the United Liberation Front of Assam, waged a brutal campaign of extortion, assassinations, bombings, and beatings from 1979 on, often targeted at Bihari and Bengali immigrant communities in Assam and oil pipelines. ULFA militants often hid in Bhutan, Bangladesh, and Burma to evade Indian authorities, transforming themselves into an international threat. The ULFA signed an agreement ending its hostilities and its official goal of Assamese independence in 2011, ending a 30-year reign of terrorism that did not succeed in establishing an independent Assam. Manipur’s United National Liberation Front and People’s Liberation Army; Nagaland’s National Socialist Council and NagaFederal Army; Tripura’s National Liberation Front and All Tripura Tiger Force; and Mizoram’s Mizo National Front are comparable organizations in the other Seven Sisters. Most of these organizations were defeated or driven underground between 1960 and 1980, but a few remain active. Ideologically, these rebel groups are highly heterogeneous. Many Northeast Indian insurgent organizations are part of India’s broader Naxalite/Maoist rebellion, wedding the desire for independent Manipuri and other states with the desire to enshrine Communism in the region. Others, such as the largest groups in Nagaland and Tripura, seek to establish Christian theocracies, using their Christian majorities as an opposition point against majority-Hindu India. In Tripura, one of the planks of the revolt is to expel anyone who arrived in or gained citizenship after 1956, in order to “purify” the state of Bengali immigrants in particular; Christian antipathy toward this largely-Muslim community is implied. Concurrently, Assam is also home to the National Democratic Front of Bodoland, the Bodo Liberation Tigers Force, and a number of other outfits which seek to further partition Assam by establishing a state for the Sino-Tibetan-speaking Bodo people. Most Bodo militant groups hope for Bodoland to be an independent state, but others claim that statehood within India would content them. Most Bodo separatist outfits have cease-fire agreements with India established in the past 15 years, but violence continues to break out in association with these groups. Similar organizations, often bearing the name “liberation front,” exist for other ethnic groups in Northeast India, such as the Karbi Longri N. C. Hills Liberation Front and the Garo National Council. An additional wrinkle is China’s insistence that Arunachal Pradesh be considered “South Tibet” and handed over to China. Based on abandoned treaty negotiations regarding the borders of Tibet and the British Raj, this claim instigated the 1962 Sino-Indian War. Though the war ended with the Arunachali homeland in Indian hands, China has not officially renounced its claim, and Arunachal Pradesh is still officially disputed between the two states. No ethnolinguistic divide more profoundly defines the Indian experience than the separation between north and south. The languages of the northern half of South Asia are part of large families that extend outside the region, but the southern Deccan is home to a language group unique to the region. The Dravidian languages are highly characteristic of southern India and places that have received South Indian settlers, and have no widely-accepted relatives. What Dravidian has in common with other families, it appears to have from 3000+ years of cross-pollination with North India’s Indo-Aryan tongues, which have liberally peppered both families with vocabulary and features from the other. This dramatic regional boundary most likely persists because northern South Asia and South India have had the kind of separate histories that neighboring countries often have. While many of India’s empires, based in either region, have conquered territory filled with speakers of the other’s primary tongues, both regions have long histories of separation from one another as well. This distinction was not lost on India’s formative thinkers in the lead-in to independence and partition. Atop existing demands for unity and separation on religious lines, a movement emerged to separate the Dravidian-speaking parts of the British Raj as a separate state, to be known as Dravida Nadu. This movement grew into an elaborate revolutionary ideology focused on secularism, eliminating caste differences (perceived as being associated with Indo-Aryan hegemony), and attaining economic self-sufficiency for South India. The introduction of Hindi to South Indian schools was a galvanizing insult, to this movement, seen as a way to further marginalize the Tamil language and art in particular. Initially, the Dravida Nadu movement (sometimes called the Dravidistan Movement) had a great deal of support within the Indian political establishment, where it was seen as an analogue for the growing push for separate Muslim and Hindu states in North India. However, E. V. “Periyar” Ramasami’s 1947 resolution to that effect faced rejection from Gandhi and Jinnah, rather than the support it previously enjoyed from Jinnah’s Muslim League, perhaps as a reaction to Periyar’s aim to merge Tamil Muslims into a renewed, indigenous spirituality. The Madras Presidency was included in India in the 1947 partition, leading to schisms in Periyar’s organization. The Dravida Munnetra Kazhagam (DMK), one of Periyar’s successor organizations, continued to push for an independent Dravidian state, and later amended its demand for a separate Tamil state. 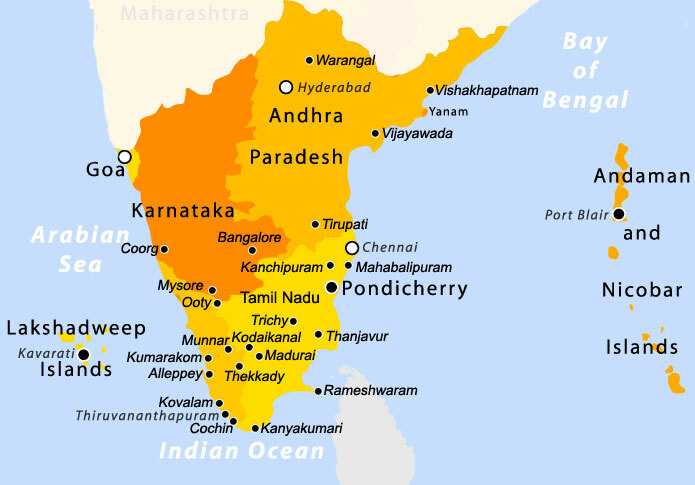 Accordingly, the States Reorganization Act, which established distinct Telugu, Tamil, Malayali, and Kannadiga states from the Madras Presidency and Dravidian-speaking parts of neighboring Hyderabad and Bombay State, as well as the Union Territories of Puducherry and Lakshadweep, largely eliminated popular desire for a separate Dravidian nation in India. This failure led to further schisms, spawning the AIADMK from the DMK. Still, South India is not done reorganizing itself. Small, largely irrelevant outfits continue to push for Dravida Nadu and/or for an independent Tamil state, sometimes involving themselves in the similar struggle in Sri Lanka. Small movements likewise push for the creation of a Tulu Nadu and Kodagu from the portions of Karnataka inhabited by the Tulu and Kodava minorities. In Tamil Nadu and Andhra Pradesh, economic and cultural differences have led to large-scale movements for separating inland Tamil Nadu as a new state of Kongu Nadu and for separating western Andhra Pradesh as Telangana and southern Andhra Pradesh as Rayalaseema. These differences are predicated on economics, culture, and a history of separation, rather than on linguistic differences, and so have met with opposition from the rest of India, which fears that such differences might lead to constant shifts in internal borders or even the total dissolution of the Indian state. The Dravidian/Indo-Aryan tension also defines the Sri Lankan experience. Already a difficult place in Indian culture due to its role as the home of demons in the Ramayana, Sri Lanka is at least as multiethnic as any similarly-sized part of India. In addition to its Indo-Aryan majority, the indigenous Sinhalese, Sri Lanka is home to a number of “tribal” groups in its interior, an indigenous Ceylon Tamil community on its coasts, the descendants of Dutch and English settlers, and an Indian Tamil community descended from indentured servants brought in as farm laborers in the colonial period. Sri Lanka’s distance from North India meant that, despite its Indo-Aryan population, it was rarely enveloped in the North Indian empires. Instead, Sri Lanka spent a great deal of its history under South Indian and indigenous control, followed by brief stretches of Portuguese and Dutch colonization. In the succeeding British period, it was administered separately from the British Raj, and gained independence as the separate Dominion of Sri Lanka in 1948, rather than becoming part of India. The years following independence were fractious and hostile, with the Sri Lankan elites voting to disenfranchise the Indian Tamils in order to retain their power and unite the Ceylon Tamil and Sinhala communities against them. This was short-lived, as the new 1956 government adopted a Sinhalese nationalist platform. Sinhalese replaced English as the island’s official language, enraging the Tamil communities in particular. Blatantly racist new standards required higher grades for Tamil entrants to Sri Lankan universities, quickly reducing Tamil enrollment. Other policies encouraged Sinhalese settlement in Tamil areas, blocked the importation of Tamil-language media from India, and offered official support to Buddhism (the majority Sinhala religion, as opposed to Tamil Hinduism, Christianity, and Islam). These policies led to the spread of Tamil separatist sentiment in Sri Lanka, and eventually, to the creation of several revolutionary organizations, most importantly the Liberation Tigers of Tamil Eelam (LTTE), also known as the Tamil Tigers. Tamil militant groups carried out attacks against the government, to which the government responded by burning the Jaffna Library, where many Tamil historical documents were stored. This move generated massive popular support for the Tamil nationalist movement and against the Sinhalese. The conflict escalated into a campaign of assassinations by the LTTE and others and then a series of ethnic cleansing attacks by the Sri Lankan military, during which between 400 and 3000 Tamils were killed and thousands more fled from Sinhalese-majority areas. For their part, the Tamil Tigers became known for attacking supplicants at Buddhist shrines and for hacking apart Sinhalese farmers with axes at night. The Tamil Tigers managed to eliminate or merge with most other Tamil militant groups, but their brutality cost them most of their former supporters. India intervened on the LTTE’s behalf, airlifting supplies and otherwise aiding the rebel movement to keep Sri Lanka weak, preserve Indian regional hegemony, and quiet incipient Tamil nationalism at home. In 1987, India reached an accord with the Sri Lankan government regarding concessions to the Tamil militants and the establishment of an Indian Peacekeeping Force, but the LTTE did not accept the accord, and commenced its signature campaign of suicide bombings that same year. The Indian force ended up in full-scale war with the LTTE, and its operations and abuses led to over 6000 casualties between the two sides and deep antipathy between the Indian government, the Sri Lankan government, and the Tamil and Sinhala populations. In 1991, hostilities between the two sides reached the point of the Tamil Tigers assassinating former Indian Prime Minister Rajiv Gandhi. India withdrew from the war at this point, but the Sri Lankan government and the Tamil Tigers did not, and it continued for another 18 years. The decades featured thousands of dead and many escalations, false starts on peace, and declarations by the Tamil Tigers that the war would not end until the region they called Tamil Eelam was an independent state. With the Tamil Tigers’ defeat, the process of peacefully resolving the enduring dispute between the Tamil minority and Sinhalese majority proceeded, following on an amendment to the Sri Lankan constitution adding Tamil as an official language. South Asia is not a single nation. Of the seven countries that currently occupy its expanse (Pakistan, India, Nepal, Bhutan, Bangladesh, Sri Lanka, and the Maldives), only two (Bhutan and the Maldives) correspond to any existing nation of people, and every one of the others has borders that cut across closely linked groups and/or unite disparate peoples into irksome and fractious countries. South Asia might mitigate its current strife by dissolving entirely, its internal divisions becoming international divisions. The seven countries would become 30 or more, each corresponding to one of South Asia’s major linguistic or religious communities. In this model, Union Territories such as Daman and Diu or Puducherry would combine with adjoining states along linguistic lines, or would claim independence of their own. Divided regions, such as Afghanistan and Khyber Pahktunkwa / the FATAs and the two Bengals, could unite, or not, as suits them. Perhaps an overarching supranational organization akin to the European Union would emerge to keep these former state-mates united after their independence from one another, in recognition of their shared history and cultural elements. Such a move would please some partisans in wealthier regions such as Gujarat, Maharashtra, and Goa, who sometimes complain that their wealth is taxed off and used to help support poorer regions like Bihar. It might work particularly well in Northeast India, which seems determined to become a sub-community of tiny, mostly Sino-Tibetan-speaking nations regardless of what the rest of India has to say about it. Unfortunately, however, such a scheme would immediately run afoul of a dense web of linguistic overlap far more complicated than the net that bedeviled postwar Europe. While South India’s four major and handful of minor linguistic communities are quite well-defined, North India’s Indo-Aryan peoples demarcate the world’s largest dialect continuum, and where Punjabi ends and Haryanvi begins, or where Haryanvi ends and Hindi begins, is a question linguists struggle to contemplate and which politicians attack instead. (Note that, above, Haryanvi was equated to Hindi to convince the people of Haryana to secede from Indian Punjab, where it had previously been considered a variation on Punjabi.) Even the basic distinction of Hindi and Urdu, bound with religious and literary significance, comes down primarily to the different scripts each language uses, with most linguists regarding them as different standardized registers of the same overarching tongue much as Swedish and Danish seem divided more by politics than intelligibility. There are more obvious poles of distinction within the Indo-Aryan continuum—Bengali and the Pahari subfamily are especially dissimilar from their neighbors—but many of the divisions are far less clear than these, and speak more to similarity than difference across North India. So, it seems more likely that other levels of division could prevail, creating a smaller number of more stable and sensible states out of the terrifying yet vibrant morass of South Asia. As noted in Shifty Lines: The Persosphere, the Afghan and Balochi regions of Pakistan have a potential future outside of South Asia altogether, joining their Afghan and Balochi neighbors. In many ways, this merger has already been realized, thanks to western Pakistan’s porous borders. Still, Afghanistan’s nonexistent central government and large non-Afghan minorities and Balochistan’s status as a region divided between Pakistan and Iran make this scenario unlikely for the foreseeable future. In a scenario where India and Pakistan fractionate, South India might be convinced to unite, bringing Puducherry, Lakshadweep, Karnataka, Kerala, Tamil Nadu, and Andhra Pradesh together into a finally realized, multilingual Dravida Nadu. Perhaps erstwhile Tamil Eelam would join them, if this dramatic reorganization captures Ceylon Tamil imaginations once more. The Bengals have much to gain from reuniting, turning Kolkata’s prosperity and numerous old ties toward a rejuvenated Bangladesh and, with any luck, using a restored religious diversity to promote the secular ideals on which both India and Bangladesh were founded rather than the creeping Islamism that has come to characterize the modern Bengali state. A Greater Bangladesh would also have a claim to the Andaman and Nicobar Islands, whose settlers are mostly Bengali-speaking and whose indigenous people (Sentinelese notwithstanding) do not have the resources to sustain independence on their own in a neighborhood that contains Burma, Thailand, and Malaysia. A reunited Bengal would isolate the Seven Sisters from the rest of India. Remote and historically linked, the region would face the choice of being conquered and absorbed by China, Burma, or both, or uniting into a new, avowedly multiethnic version of Undivided Assam. Only an overt and intentional policy of respecting its numerous distinct communities has a chance of keeping such a nation intact without the counterbalancing force of the rest of old India. In the extreme northern reaches of India, the Himalayan states—Gilgit-Baltistan, Azad Jammu, Jammu and Kashmir, Ladakh, Himachal Pradesh, Uttarkhand, Nepal, Sikkim, and Gorkhaland—would recognize their shared cultural elements and, in many cases, history as part of a larger Nepal and throw in their lot with Kathmandu, rather than continuing to be divided between India, Pakistan, and a reduced Nepal. Pahari, whether in standardized form or as a dialect continuum of its own, would become a world-class language thanks to being the official tongue of a state encompassing nearly the whole of the world’s tallest mountain range. Such a state would have to find a way to accommodate a much more diverse religious environment. The remaining segments of South Asia would then, in this dream, unite as a single Indo-Aryan state, adding Sindh and Pakistani Punjab to the remaining pieces of North India. Perhaps this new state would rename itself Aryavarta, or one of the other ancient names for northern South Asia. With the major conflict zones of Kashmir, Northeast India, and Bengal and the highly dissimilar counterpoint of South India removed, New Aryavarta could then focus on rearranging its own internal borders in Bihar/Jharkhand, Madhya Pradesh, and other areas to more accurately reflect its own diversity, and set up a model that doesn’t disenfranchise Bihar and Jharkhand in favor of Gujarat and Maharashtra. Southern Sri Lanka and the Maldives, Indo-Aryan-speaking but at substantial geographic and cultural remove from North India, could join it or remain independent, as they prefer. This is a fantasist’s scenario, one that banks on the unlikely assumption that the religious divides in Punjab, Kashmir, and Bengal can be bridged by the same bond of common language and culture that failed to stop them from forming in the first place. Yet a model where such divides are not bolstered by attachment to larger nations defined on those terms might help change the tone of these regions, and set up a system where nations—true nations—can form and more effectively remove those who would foment religious and other sectarian differences in South Asia. And that world, that world would be very interesting.